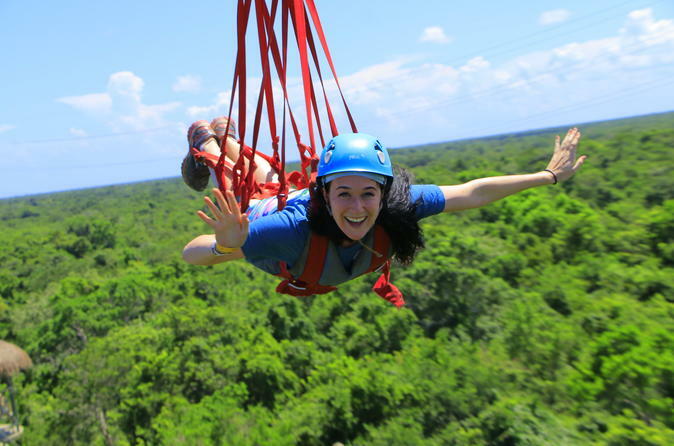 Spend a thrilling afternoon facing your fears at Selvatica adventure park, just a short ride from Playa del Carmen. Soar through stunning Mayan jungle on a series of ziplines, maneuver your way across ariel suspension bridges and swing through the skies on a bungee ride aptly named the Tarzania Coaster. Then go off-roading on a buggy ride through the woods. Cool down with a refreshing swim in a cenote, or natural sinkhole, and savor a well-deserved lunch while swapping stories of your spectacular feats. Departs from centrally located Playa del Carmen hotels. If your hotel is located outside the pickup zone, a central meeting point will be advised upon reconfirmation.